There are certain days where you know you’re going to need something comforting on deck. Today is one of those days and the sun hasn’t even risen yet. 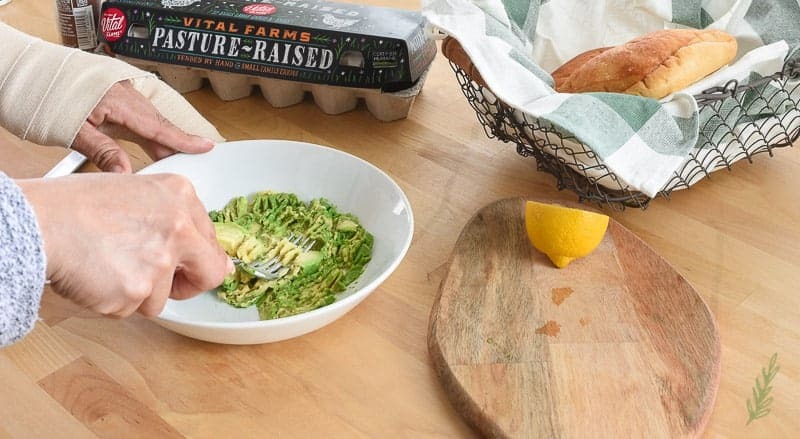 Whenever I know I’m going to be running for the better part of the day, I like to have ingredients on hand to make these Avocado Egg Baguettes. Today is the first day of the rest of our lives. That sounds ominous, I know. I have a flare for the dramatic. Today (in a couple of hours, in fact) my husband will give up his “diamond”. Not his wedding ring- because what dude needs a diamond wedding ring? His First Sergeant’s Diamond. Neither of us got much sleep last night thinking about it. I’m trying to verbalize the feeling I have that is causing so much angst. It’s like our children are leaving home from college, only we’re the ones technically leaving. And our “kids” are grown adults who are combat medics and medical professionals. See, in the Army world, the First Sergeant is the highest-ranking Non-Commissioned Officer who still has a direct “hands-on” leadership role in the lives of all of their company’s/detachment’s Soldiers. They’re the Mom/Pop of the unit. Sure, there’s still another rank higher in the enlisted corps, but the 1SG is the job most NCO’s live for. I know it’s what Hector looked forward to his whole Soldiering career. And today, at ten AM, he passes it on to his successor. As the 1SG’s wife, I could’ve played two roles: hands-off or dive in head first. I chose the latter. 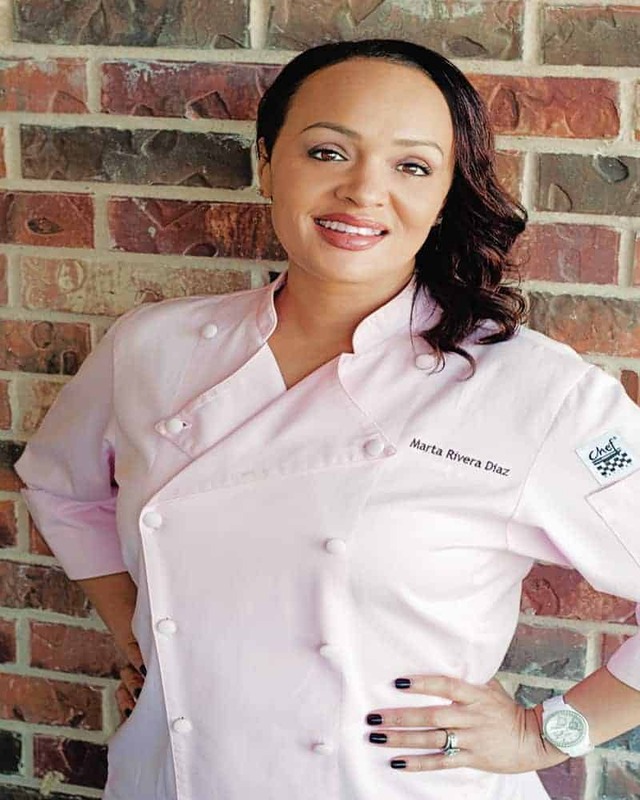 Almost twenty years ago, I walked away from a promising career as a chef to support Hector’s military career. Truth be told, the military lifestyle wasn’t conducive to rising in the kitchen brigade. The moment I made that decision, I decided to do so the same way I do everything in life- all in. This assignment and the role my husband now served in was no different. I set out to give all I could to my husband’s Soldiers and their families. We’ve been through a lot together, too. Two deployments, deaths, sicknesses, births, divorces, and too many laughs to count. Today is a tough day. That’s one of the reasons I’m making something simple, yet comforting. These Avocado Egg Baguettes are filling, but don’t require too much thought once you know how to assemble them. Anything that contains egg in my kitchen will include Vital Farms Eggs. I can’t tell you how many stores I’ve gone into and requested that Vital Farms to be put on the shelves. Most of the store managers look at me like, “Yeah, whatever.” But the rest are accommodating, then grateful. Once they stock it, they seem to do well selling them. 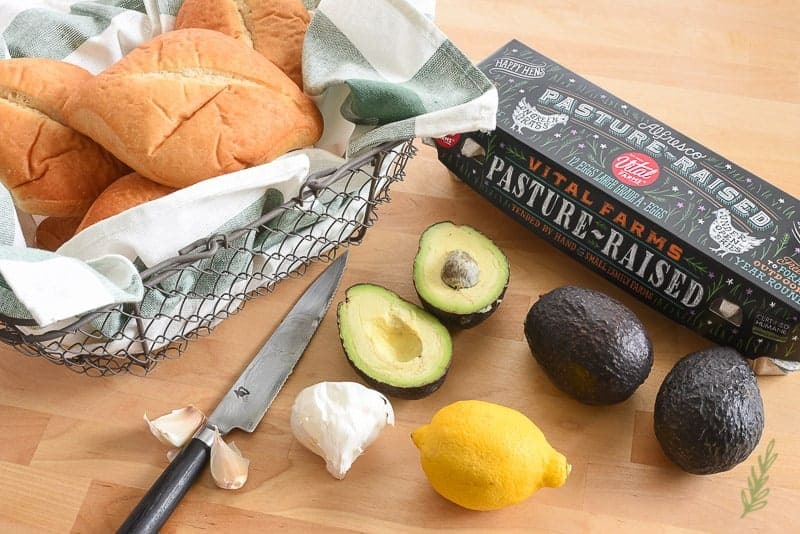 Pasture raised is different from “cage-free”. I watched a Netflix documentary called Rotten that shined a light on the poultry industry. Farmers in one of the Carolinas showed their “cage free” chickens. Thousands of chickens in a warehouse. It wasn’t pretty. For me, Vital Farms eggs are the next best thing to raising chickens and getting my eggs fresh from them. In addition to quality eggs, crispy mini-baguettes and ripe avocados are all you need to complete this dish. Seasonings and flavorings can vary depending on your mood. Today, I’m going for a garlicky-lemony-dill vibe. Kind of a sour taste for my down-in-the-dumps mood. 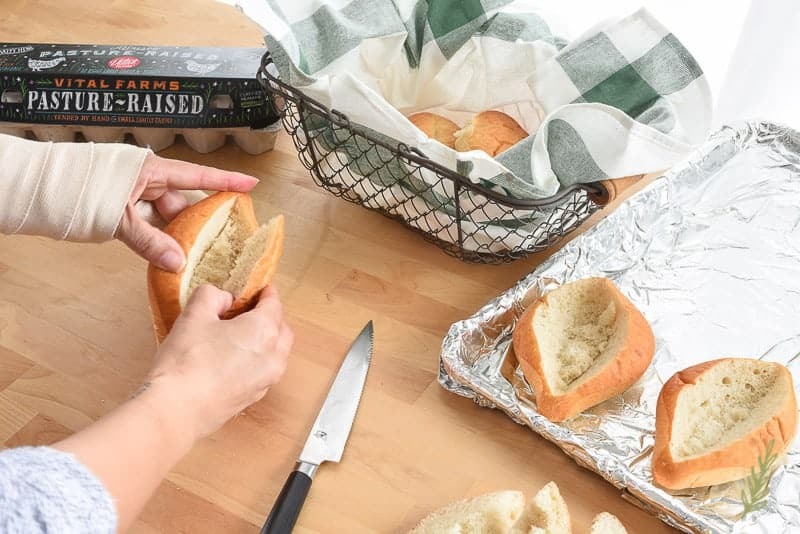 The first thing you need to do is create the “boat” of bread. I do this by cutting out a “cat eye” shape from my store-bought mini-baguette with a panini knife (or small bread serrated knife). Starting at the center of one end of the baguette, begin cutting the oval shape making sure to keep your knife at forty-five degree angle. Start at one end and cut to the other end. Repeat on the other half of the baguette. You should end up with a cat-eye shaped top piece that should easily pull out. You can save these top portions for breadcrumbs, or for making croutons. 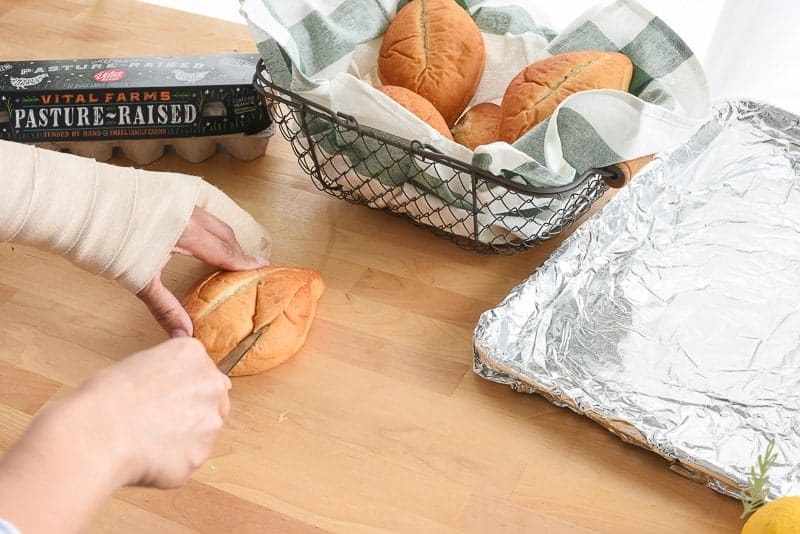 Place your hollowed-out baguettes on a sheet pan lined with foil. Bake these for ten minutes in a three hundred-fifty degree oven. Baking the baguettes prior to filling them creates a dry crust that won’t get as soggy as an unbaked baguette would. While your baguettes are baking, prepare your avocado spread. 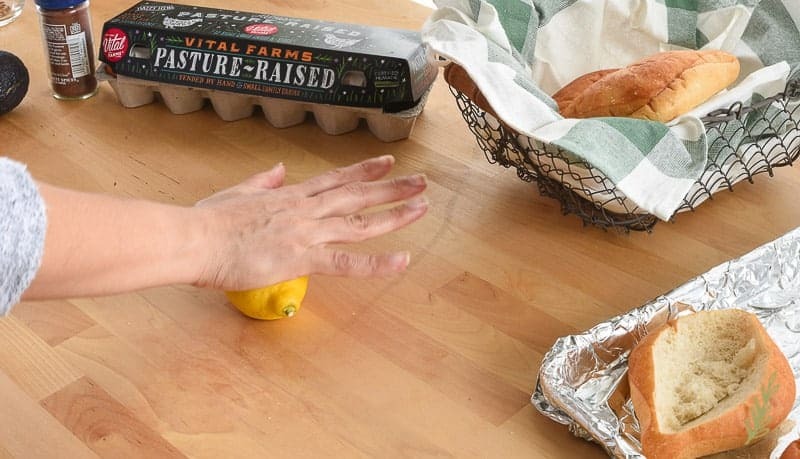 First, get your lemon ready for juicing by rolling it between your palm and the counter. This breaks up the fibers inside the lemon. Loosening the fibers releases more juice than you’d get without rolling. Cut your lemon in half and juice it using a citrus press or a citrus juicer. Set this to the side. No, I do take avocado shopping seriously. My tips for picking the perfect one? choose an avocado that is slightly firm to the touch. When pressed, the perfect avocado should give way just a little. If it’s soft like a ripe banana, it’s too far gone. Anything rock hard, like an apple will take a few days to ripen. It should be as firm as a ripe strawberry. an avocado with the nub of the stem still attached is probably perfect. Under that stem you’ll be able to tell if it’s perfectly ripe of not. If you’re using it the same day, pick it off. Is it pale green? It’s perfect? If it’s black or dark brown, it’s past its prime. 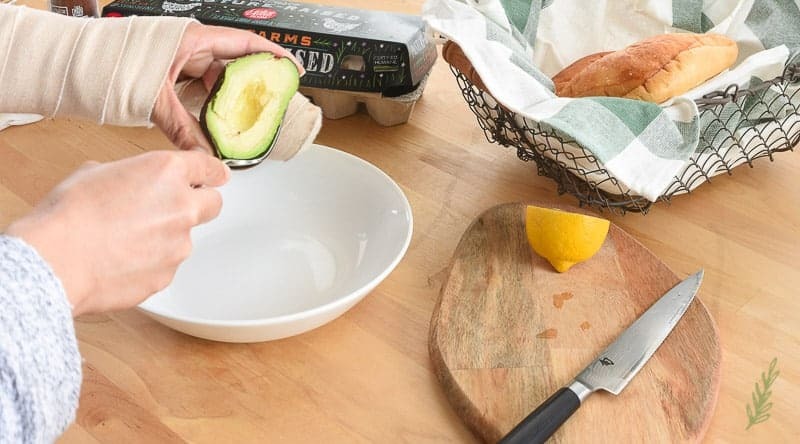 Once you’ve picked the perfect avocado (or two or three, depending on how many baguettes you want to make), cut around the avocado, lengthwise. I hold the avocado in my non-dominant hand and pierce the top of it using the center part of my knife’s blade. Then, holding both the knife and the avocado horizontally, I rotate the avocado 360° to cut it in half. From there, I take the heel of my knife (the widest part of the blade closest to the handle) and whack it into the pit of the avocado. That pierces the tough pit and makes it easy to wiggle free and remove. Discard the pit. Use a fork or a spoon, inserted right where the skin ends and the flesh begins, to scoop out the avocado flesh. No need to worry about a perfect extraction, we’re going to mash it anyway. Scoop it into a shallow bowl. Use the same fork you scooped the avocado out with to mash the avocado. I like to leave mine slightly chunky so I only mash a little bit. If you prefer a smoother spread, mash to your heart’s content. I’m a sucker for avocado toast. My favorite way to flavor it is with freshly grated garlic, lemon, dill and a hint of sumac (a Middle Eastern/North African spice that has a lemony flavor). I use a small grater (or microplane) to grate the garlic finely. 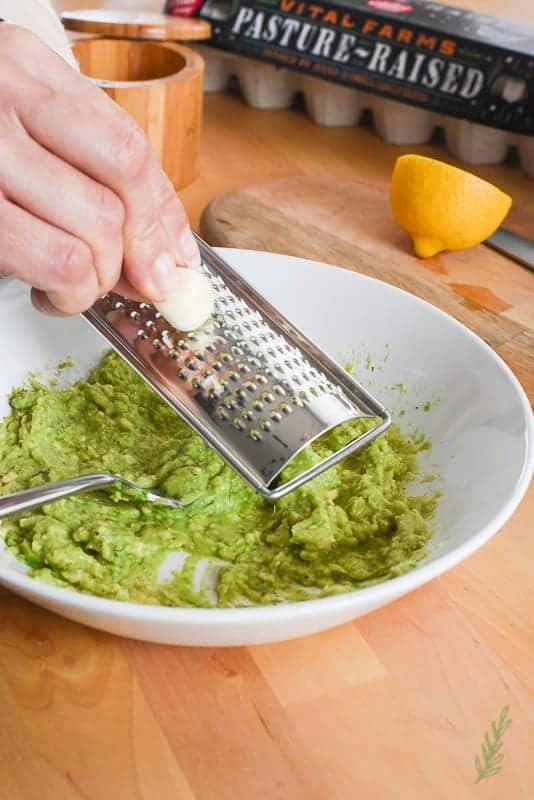 Just grate it right into the avocado mash. If you’re not a fan, omit it or just use a small amount. I use a whole clove for my family of four. Add the seasonings. Again, I’m using kosher salt, a little black pepper, dill, and sumac. You can mix and match flavors, omit the sumac- whatever. This is a customizable experience. Add the lemon juice and mix everything together. 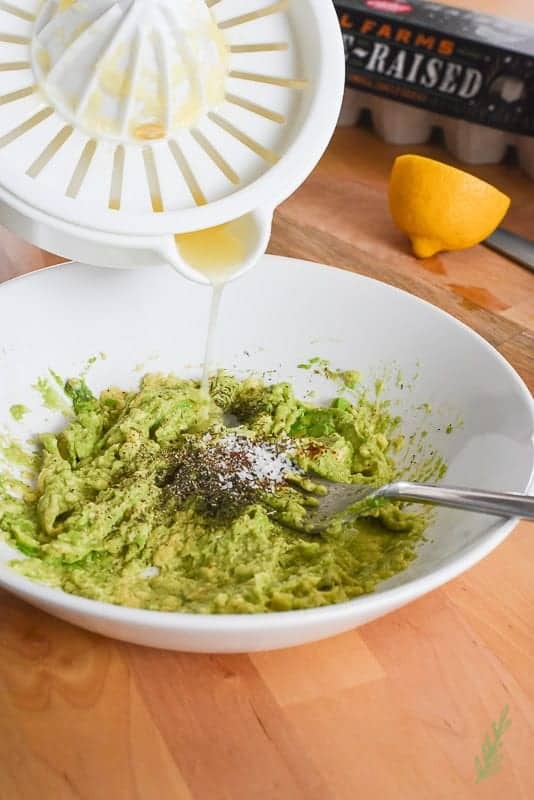 The lemon juice not only flavors the mash, it also helps stave off the oxidation of the avocado and prevents too much of that icky browning that happens. 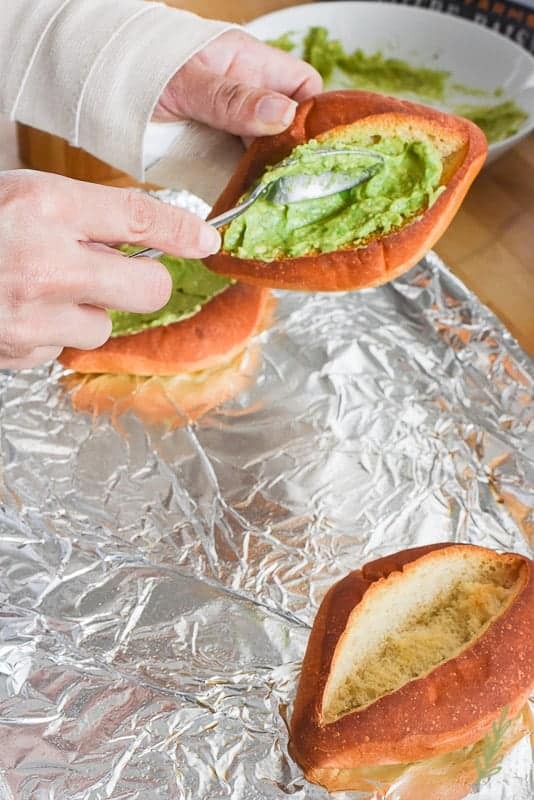 Use the back of a spoon to coat the inside of your baguettes. 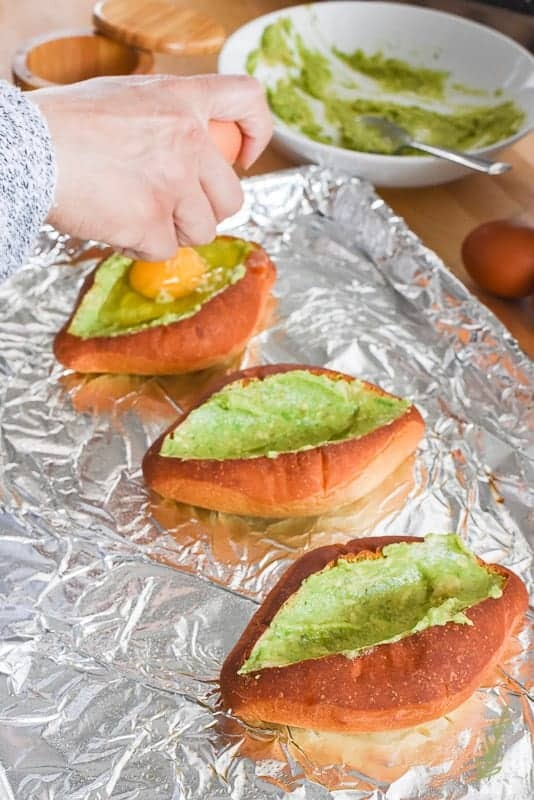 The last step before baking is to crack an egg into your avocado-coated baguette boats. Baking is simple, if you are a soft-boiled egg lover, broil on low for 5 minutes. Like your eggs, medium? Broil on low for 7 minutes. If you’re a no-runny-yolk type of person, broil on low for 9-10 minutes. Keep an eye on your egg as all ovens are different. The white of your egg should be completely opaque. Pull your baguettes and allow them to rest for 5 minutes before eating. This rest will allow the egg to continue cooking to perfection. I’m going to serve mine for lunch with a simple salad on the side. We’ll spend the better part of the day reminiscing about our time with our Soldiers, and this will alleviate any fussy meal prep. Here’s to new beginnings and cherishing the memories. Pin this for later and share with your friends and family! 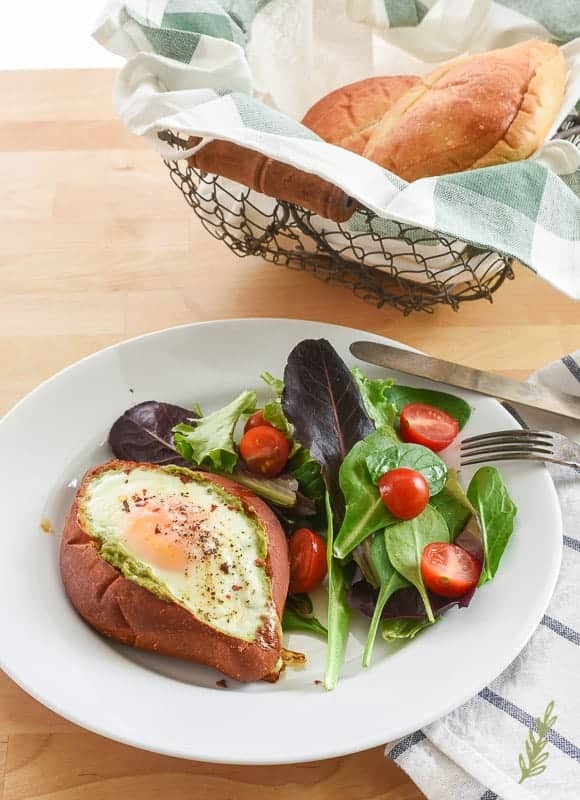 Avocado mash coats the crispy egg-filled baguette for the perfect breakfast, brunch, or lunch! Preheat your oven to 350°F. Line a sheet pan with foil. Cut out a "cat eye" shape from each baguette with a panini knife (see detailed instructions in post). Place on the sheet pan and bake for ten minutes. Holding a chef's knife and the avocado horizontally, rotate the avocado 360° to cut it in half. Use the heel of the knife remove the pit of the avocado, then discard the pit. With a fork, or a spoon, to scoop out the avocado flesh into a shallow bowl. 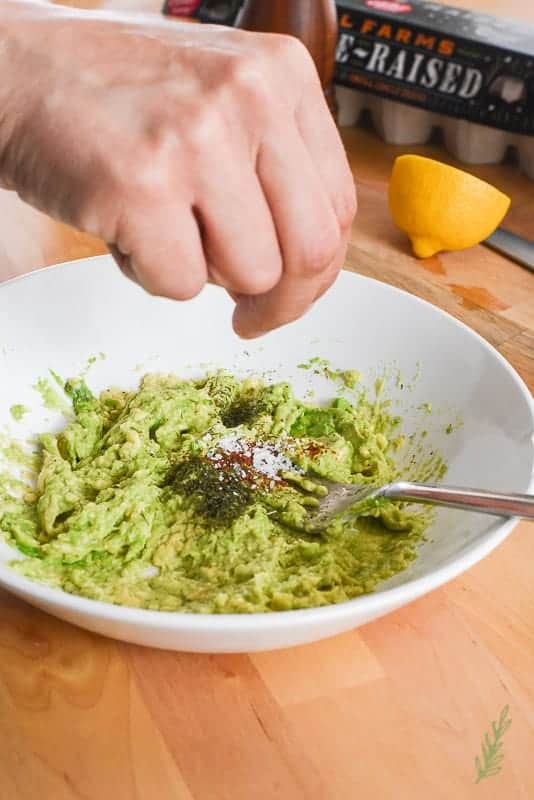 Use the same fork you scooped the avocado out with to mash the avocado. Add the garlic and the rest of the seasonings. Finally, add the lemon juice and mix everything together. Use the back of a spoon to scoop up about 1/4 cup of mash and spread it inside the bread to coat your baguettes. Crack an egg into each of the avocado-coated baguette boats. Broil on low as follows: soft-boiled egg for 5 minutes. Medium for 7 minutes. Hard for 9-10 minutes. Keep an eye on your egg as all ovens are different. The white of your egg should be completely opaque. Pull your baguettes and allow them to rest for 5 minutes before eating. This rest will allow the egg to continue cooking to perfection. Enjoy immediately after resting by itself or with a side salad. With tears in my eyes…..I am so proud of both of you! 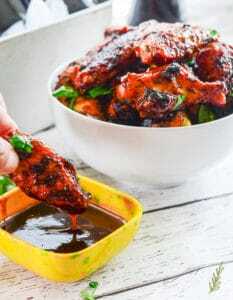 I will be trying this recipe, it seems unique and yummy! I wish you Godspeed in the next stage of your life! Thanks so much, Iris! Retirement is looming and it seems so official! Wow, I love avocado but I ‘don’t eat eggs (as I’m vegan), what can I use instead of eggs? If you have to leave out the eggs, I would just go with avocado. There’s not much else that will fill up the boat quite like an egg will, but you can stuff it full of the avocado mash after toasting the boat. Skip the final broiling stage as well. I just love this idea!!! Avocado toast topped with a fried egg is my favorite breakfast and I love your baked version! I’m so glad you like it, Jereann! 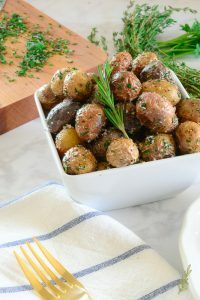 2)I’m gluten-free, but i think this would be awesome in a potatoe! For sure, Alicia! Baking it for 45 minutes until soft and topping with the egg and avocado would taste great! 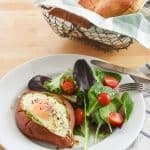 This avocado egg boat sounds delicious! I love anything that includes eggs! Me too, Shana! They make anything a meal, don’t they? Thanks, Steph! They’re definitely a change from the traditional healthy breakfast. Wow, I can’t wait to try this over the weekend! It looks so yummy! I hope you love them, Crissy! I thought that baguette was a potato at first! This looks like a tasty meal! I just replied to another comment from a gluten free friend. That’s a great idea to sub out potatoes for the bread. These sound so amazing! I am not a huge breakfast fan but this would definitely make me think twice. I’m not a huge breakfast fan either, Becca (which makes me an oddball in my family). This made me a convert. I’m not a big egg person but this looks good. Love avacado. I don’t always eat eggs, but for some reason, Angela, these aren’t as “eggy” as eggs can be (I know that sounds absolutely crazy). I think the mix of the bread and the avocado spread tempers them. 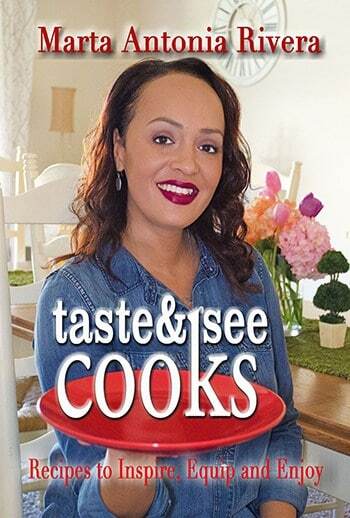 I’m going to have to try out this recipe! I loveeee avocado! Goodness those baguettes look delicious! I bet this recipe would be great with sweet potatoes too. I need to try this recipe I love anything with avocados. Kim, it seems like potatoes (any variety) would be an awesome substitution. I’ll have to give it a run soon so I can report back. Thanks so much! Sounds like a yummy breakfast! It definitely is, Mariah! Breakfast, brunch, lunch, brinner, dinner…midnight snack. LOL!! !